Yes. You can now customize your signature in GMail. This is a feature that I had been waiting for GMail to introduce. There were times when I wanted to introduce my services with a few links to content to my clients on Elance, Guru and oDesk, the freelance sites where I am active. One of those Firefox addons that I used was Wisestamp. The problem with it was if people were accessing mails through their Outlook, Evolution or Mozilla’s Thunderbird or other mail clients they were unable to read my custom signatures. Wisestamp displays my latest posts when I added my RSS feed to it. You can customize your GMail signatures now. All you have to do is log into your GMail account (Created an account here if you do not have one) and login. Click on settings tab that you find on your right top hand side. There under the general tab, scroll down and you will find the Signature box. Now you will see a rich text editor. Enter the text like your name, a designation with other contact details. You can format the text, add links and insert images to add more value to your signatures. Images You cannot add images from your desktop. However you can add images from the web. In case you want to add a logo or a specific picture, I suggest that you upload to your Picasa or Flickr account. Add tags to the image. Copy the link to the image and add it in the Web Address URL box that pops up when you click on the insert image icon. If the image is small and the URL you entered is correct, it shows up almost immediately. Save your settings. Now click on the compose mail link and in your mail composing box, you should be able to see your signature in all its glory. To edit it, you need to go to settings and tweak it. In case you already have multiple custom addresses, you can create a unique signature for each address. I remember using it with Live Search. Then Bing happened last year. And this morning I noticed Google do it. To emulate is to flatter. So does Google now. Google has begun to roll out it’s home page customization and is likely to roll across the world in the next few weeks. 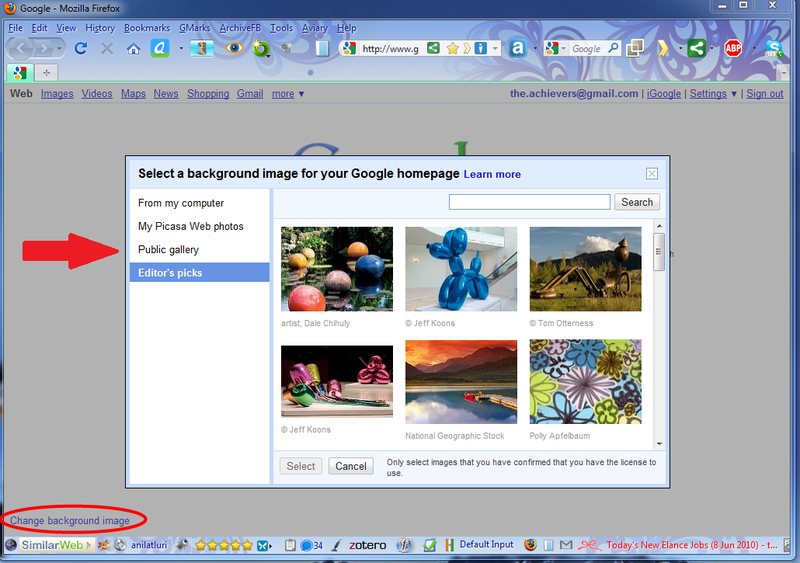 Open your Google Home page and you would notice at the lower left corner the option, ‘Change background image‘. Click on it and you are taken to the next screen, with options: ‘From my computer, My Picasa Web photos, Public gallery and Editor’s Picks’. Choose any one of them and your ‘Google Home Page Customize’ is complete. You would be privy to your own ‘Customized Google Home Page’. You already have your background pictures, frames and what not. Do you really need it? I mean do you really need to ‘Customize Google Home Page’? At the end of the day what matters is, does Google deliver what you search for? Not all that eye candy. What do you think? Does customizing your Google home page help? How? You love Bing because it offers you better pictures? Does it matter? How do those pictures help you, on the homepage? Care to share your thoughts! Leave a comment, now. Don’t worry I will not spam you. I promise. Neither will I share your email id with anyone else. Does GMail’s ‘Forgotten Attachment Detector’ Read Your Mail? Does GMail find attached files and read them? 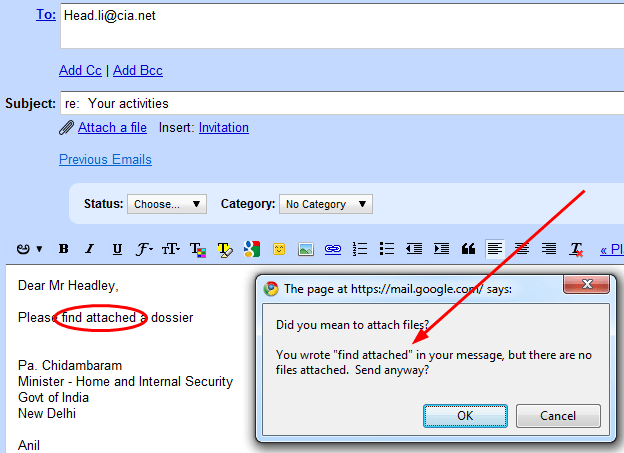 Were you ever prompted by GMail to check if you have attached your files after hitting the ‘send’ button? I had that experience many times. That was then, a few years ago. GMail then had a ‘Forgotten Attachment Detector’ by a Jonathan K, tucked in, under the experimental features ‘labs’. One had to enable it. You do not see that feature under ‘labs’ anymore. Now, in your GMail, when you compose a mail and hit the send button, it asks you, “‘did you mean to attach files? You wrote ‘see attached’ in your message, but there are no files attached. Send anyway? '” , a gentle reminder. I found out something else. This doesn’t work out all the time. 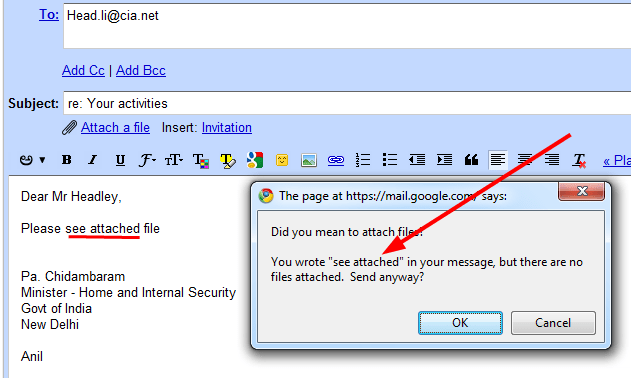 It is not that GMail reminds everyone that mention a ‘file’ or ‘attachment’ in their message. GMail responds to only to that phrase ‘see attached‘ or ‘find attached‘ and warns you if you have not, by then, attached any files. Even the reminder that it throws up replicates it in the prompt. Check screen shots I took with those two different phrases.